These pads are true to their name – they provide our patients with a Mini Peel! 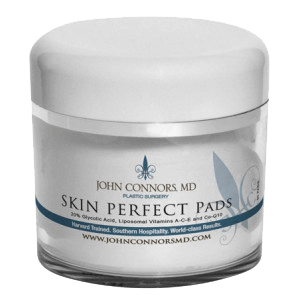 Convenient and easy-to-use, Dr. Connors’ Mini Peel Pads gently exfoliate, moisturize and assist in the removal of oil and residue on the skin. They are perfect to use in between treatments of the medical grade peels that Dr. Connors performs for his patients in the office. At night, remove a saturated pad from the jar and wipe the textured pad over the desired area to be cleansed. Use approximately 3 times per week.